I just got off the phone with Jim. “Get Hunter’s bedroom ready, we’re going to have an overnight guest tonight.” He informs. Needless to say my attitude stinks–I know this. And I admit, I wish my heart’s response was more Christ-like. But it wasn’t. Regardless, that’s not what this is about. We have a room in our new home decorated exactly how Hunter’s room looked in our previous home. 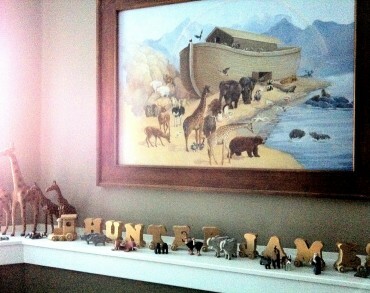 You can see from the picture that he had a very boyish, rustic Noah’s ark theme. Because God keeps His promises—and I need to remember this, often. …and everything else Hunter but memories. Get that bed made and get out of that room. I want to stop running. I don’t watch the videos or…look at certain pictures. Actually, I’m just tired period. I’m marking it on the calendar of my heart. I’m not going to run anymore. For as long as He wants me to. I’m going to watch all the old videos. I’m going to pull out all the pictures and get them scrapbook ready. UNTIL I SEE HUNTER AGAIN. I imagine that you might be running too—for too long. And maybe you’ll consider for this moment that it’s time for you to stop too. Right where you are in this journey! Will you let Him into all that you’re running from? Will you let Him carry you and cover you with grace? Will you let Him be for you all that He has promised? No matter what it costs in time and tears, will you stop running?